Easter is the most important and fastive of Christian holidays in the Orthodox Church as in others. In Russia, it is customary to mark this day with the exchange of painted eggs. The eggs commemorate the suffering of Christ and are a symbol of his miraculous resurrection from the dead and his redemption of the sins of man. The Egg shaped form has always been a popular media in Russian Art. This tradition goes back to 800 a.d., when Russia adopted Christianity. The egg is the beginning of life, and for centuries, iconographers have carved eggs from wood to paint on them icons. This tradition is still alive today, although the art itself has become more and more divers. The name of Faberge has become a byword for opulence and luxury, and is particularly associated with Romanov Tsars of Russia. 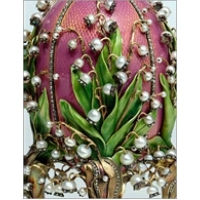 When Peter Carl Faberge, the son of a goldsmith, took over the family business, he began designing magnificent objects of fantasy rather than the heavy gold jewellery preferred by his father. As his reputation grew, he was appointed Court Jeweller to the tsars and his craftmanship became legendary. His superb technical skill was perhaps best demonstrated in the glittering, bejewelled Imperial Easter eggs which continue to dazzle and fascinate all who see them. Faberge Style Egg "Clock with Rooster"